Sarah Gooll Putnam, a teenager (who was 14 years old in during the spring 1865 and lived primarily in Boston, Massachusetts), describes the shock and sadness of hearing about the assassination of Abraham Lincoln. Her diaries (started in 1860, when she was 9, and continued until close to the time of her death at age 61 in 1912) feature many illustrations. 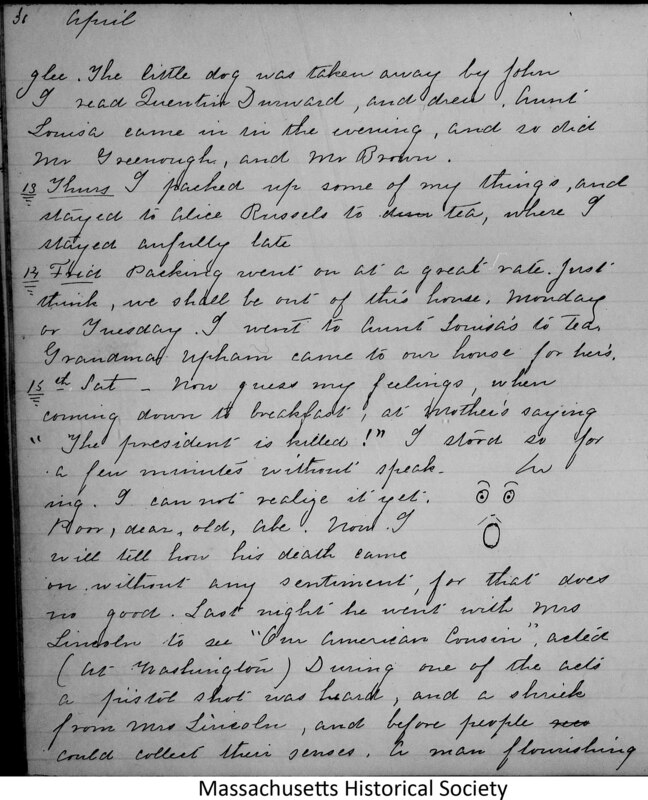 The entry for 15 April 1865 includes a minimalist sketch of a face with a shocked expression. Mr. Greenrough and Mr. Baron. Grandma Upham came to our house for her’s. No good. Last night he went with Mrs. [?] went to Grandma Upham’s.